Many of us are pet and animal lovers, and the pet owners among us know and understand well that special bond between ourselves and our pets. But if there is one relationship which runs deeper than most, and as such is unique, it is the bond that exists between older people and their pets. Many elderly people go shopping to get food for their pets, often when they woulnd't bother if they just had themselves to feed. Some put the heating on or turn it up to keep their pet warm. Frequently, the pet is all the elderly person has left in the world. For the elderly, pets are a wonderful source of companionship at a time when many are lonely. Their spouse may have passed away, as may many of their friends, so their social networks are diminishing, and many receive little support from their families. In 2004, the WVRS reported that one in ten elderly people sees no-one on a typical day. 20% of old people are 'often' or 'always' lonely. No wonder pets play such an important role in providing comfort, companionship and love. In 2003, the Pet Care Trust's survey discovered that 80% of older people thought their pet offered unconditional love and companionship and prevented loneliness.. Many old people find that it’s easier to meet and talk to people when you have a pet. They have to get out and about to exercise with their pet. Animals encourage old people to move, simply even the act of bending down to stroke a cat or dog helps. One characteristic about life today is that the powers that be don’t seem to be able to function without talking about measuring effects, outcomes, results, specific benefits. There are places for these things. But love and companionship don’t fall into these categories - they are priceless, and they are what makes the difference between an institution and a care home. They are sit in the heart and soul of what we all are. Life becomes meaningless pretty quickly without love and companionship, and the ability to nurture and feel wanted. Pets offer our elderly people all these things and make life worth living for many old folk. It's up to the rest of us to recognise that the bond is a special one; and to do what we can to uphold it. When an elderly person is going into a new home, often the pet is the only thing they have with them which truly links with their past. Pets play a role in helping staff de-stress; they provide safe talking points and grandchildren are more likely to visit if there is a pet to cuddle too. There are some fantastic organisations doing amazing work to uphold the cherished bond between the elderly and their pets. They are having magical results. Foremost amongst these is the incredible Cinnamon Trust, which works to keep pets and their elderly owners (and people who are terminally ill) together. The Cinnamon Trust has many reliable volunteers who will help the elderly with tasks such as dog walking and taking pets to the vet, either from the older person’s own home or care home. 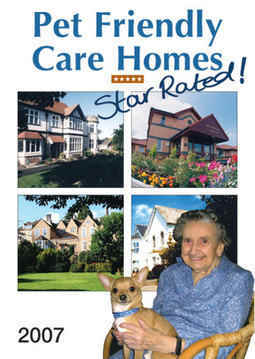 In addition, it has a large database of care homes and sheltered housing which accept pets along with their owners. So if you’re looking for a home which will take a relative and his or her pet, contact the Trust . Now, perhaps you’re starting out on the search for a care home for a relative. You may be thinking that the process is stressful enough without taking pets into account. Thoughts such as “Madge will soon get over Tiddles” and “it will be easier for everyone if the Rover is rehomed” may spring to mind. we re reluctant to confide in staff the reasons for their happiness, feeling these emotions would not be understood or brushed aside. Obviously there are times when it really is not possible for an elderly person to take his or her pet with him into a home. Units where a very high degree of nursing is required may be one. But with a little effort, much can be achieved to accommodate pets to the delight of residents, staff and visitors. Care home managers can be amazingly helpful and accommodating, especially if they are animal lovers themselves. The Cinnamon Turst recognises those homes which go the extra mile to promote and uphold the bond between the elderly and their pets with its Pet Friendly Care Home Award. Hundreds of care homes and sheltered housing facilities do take pets very successfully, so the idea does work if well planned and thought through. Elderly people deserve love and companionship. Looking after someone they love helps them continue to nurture, grow and feel needed – all essential elements of being a happy human being. The Society for Companion Animal Studies (SCAS) has a campaign, Pets for Life, in partnership with the Blue Cross and thePet Food Manufactuer's Association. The aim is to encourage care home providers to allow oler people in residential care to benefit from the companionship of pets and the proven health benefits that they bring. In July 2009, the Petes for Life Campaign came before the House of Commons as part of a Ten Minute Rule Bill. This bill, led by Dr Nick Palmer MP, proposed that ressidential care homes and shleterd accommodation should implement responsible pet policies to ensure that residents - both current & prospective - could make informed choices about pet ownership. The Bill was well received and Dr Palmer continues to raise awareness of this issue amongst his peers and colleagues. Pets for Life will be a campaign worth watching and supporting.